Set in the historic camp meeting community of Mt. Gretna, this circa 1910 cottage is a restful break from the fast pace of modern life. It has been updated while retaining its historic charm. Some streets are pedestrian only and all are very narrow. Camp Meeting community is set in a canopy of trees over 100 years old in its' own micro climate- cooler in the summer and warmer in the winter- due to these beautiful trees. The cottage is rustic, eclectic, comfortable. Many books and games available. 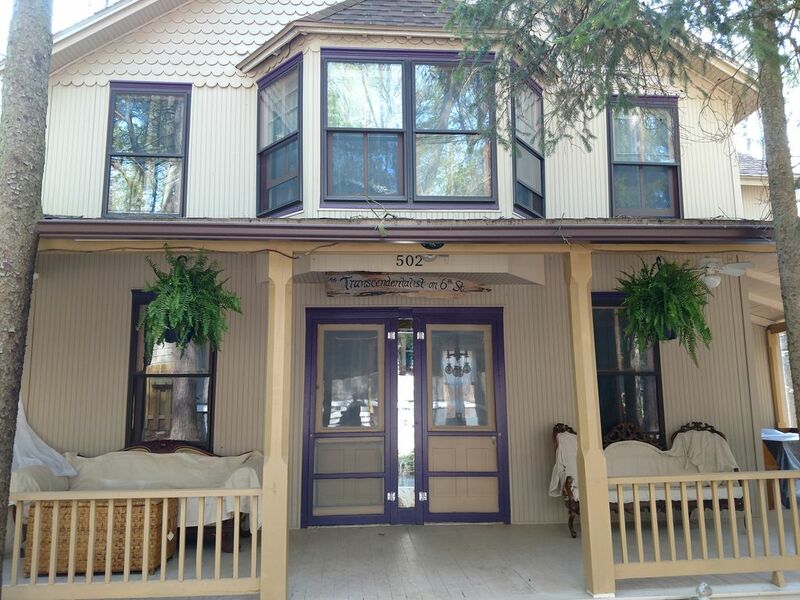 The cottage is located within walking distance of all Mt. Gretna has to offer such as the Lake, Jigger Shop, tennis courts, theater, playgrounds, hiking trails. We live on a small farm 20 minutes from Mt. Gretna in Elizabethtown, PA. We raise sheep, alpacas, chickens, cats and 2 boys. The farm also has a historic mill, built in 1774, that we maintain as a museum of milling and agriculture. We have been renting a second farmhouse (#246632) on our farm for about 8 years and it has been an awesome experience meeting new people from all over the country and overseas. Check out our other listing to read our great reviews. We love going to Mt. Gretna to see plays, take hikes and go out to eat so when the opportunity arose to buy a cottage, we jumped. This particular cottage appealed to us with its large comfortable front porch, peaceful location with no traffic and very vintage character. The cottage has an open floor plan downstairs with lots of windows which lends a more spacious feel. Upstairs is light and airy with 4 bedrooms and 1 large full bath. We updated some key features such as a totally new kitchen and new fixtures in the bathrooms while keeping the best parts such as the original cast iron claw foot bathtub and wooden walls. We chose not to install air conditioning, relying instead upon the natural coolness of the 100 year old tree canopy and fans. The cottage is decorated with mostly vintage furniture that is also comfortable. We hope you will find the cottage to be as charming and rejuvenating as we do. If guests have the time and interest, we offer a tour of our farm - you can feed the animals, see where your eggs came from, tour the historic mill, jump the rocks in the Conewago Creek. Just let us know if that's something you would like to do. The cottage is located in the historic Mt. Gretna Camp Meeting community. The original lots were sized for tents so houses are close together and quite a few streets are pedestrian only. 6th Street is a very narrow road. You turn onto 6th St from Boehm St and pass a few houses. It is best to back into the spot. There is room to park one vehicle beside the cottage. We provide eggs from our farm and some other treats to welcome you. Eat at Porch and Pantry for a delicious breakfast! The Jigger Shop is where you go for ice cream and casual food in an outdoor setting. You can also walk to the pizzeria and a few other restaurants. Mt. Gretna has mini golf, a roller rink, a lake for swimming or renting canoes, a live theater, Tabernacle with concerts and Chautauqua events during the summer.